“The gentle art of persuasion,” chapter 11 of Martha’s Children, is now up and available. Ned and the sorceress Love try to remove the diminutive vampire Martha from Chicago before she gets out of hand. Maybe they’re a bit too late? If you’re not already reading this serial of vampires and cops, and sorcerers, too, set in 1969, you can start here. The blood lust of vampires and its relation to sexual lust has been an enduring theme in the literature and visual media. 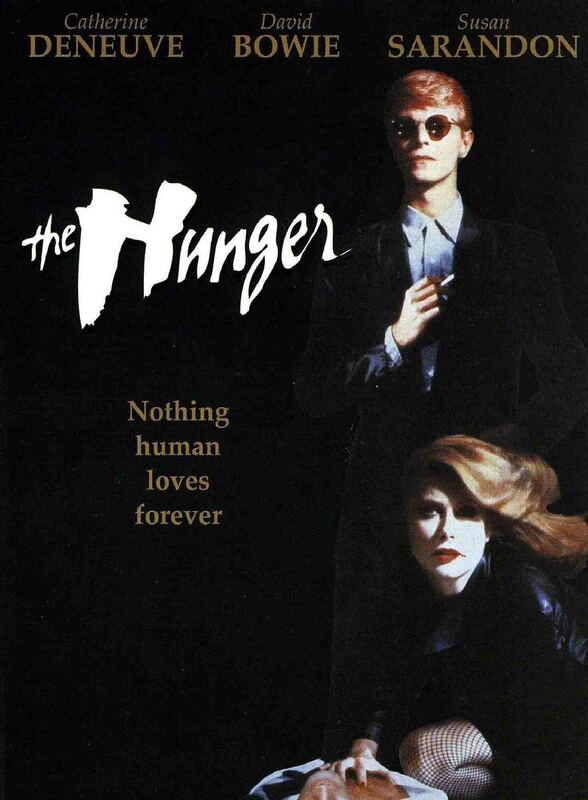 After exploring it myself in chapter 9 of Martha’s Children, I was motivated to look up and watch one of the more unusual films portraying this relationship, 1983’s The Hunger (see trailer), based on the Whitley Streiber novel of the same name that came out two years previously. The Hunger is famous for its lesbian sexual scene between vampire Catherine Deneuve and victim Susan Sarandon. But there’s more here to sink your teeth into. Deneuve’s Miriam Blaylock is a vampire that looks human but is of another species. In the movie, she seems capable of seducing just about any human she chooses into submitting to her. She can kill them, or she can make them into her partners by giving them some of her blood, which turns them into human vampires. Giving her partners the blood lust is psychologically her way of ensuring their sexual fidelity to her, if for no other reason than that any other potential sexual partner ends up dead to feed the blood lust. Provided they don’t mind sacrificing another human victim every week, Miriam’s partners seem to have the best of both worlds, sexual lust and blood lust, for several centuries . . . until they suddenly grow old and helpless, yet still immortal. That’s the price Miriam’s human partners pay in the world of The Hunger, a variation of Tithonus’s bargain: after a few centuries of youth and fun, they become old and withered, but cannot die. David Bowie gets to see this happen to himself at the beginning of the film. Once he ages, Miriam just places him in a box, to stay there for all eternity, along with her other lovers. Most reviewers have focused on the familiar trade-off between immortality and killing others that Susan Sarandon’s character faces when she is turned into a vampire. However, to me, the really interesting moral issue is the behavior of the inhuman vampire Miriam. Although she knows her chosen partners will eventually age and have to spend the rest of eternity as withered wrecks in a box, aware but incapable of action, Miriam continues to create new partners, simply because she is lonely without one. Far from being an act of kindness, Miriam curses her partners with untold millennia of suffering just to enjoy their company for a few centuries. She offers no real choice: she will destroy you now by taking your blood and killing you, or she will destroy you in a few centuries when you wither and become helpless, shut up in a box. And that helps explain why The Hunger was not popular when it was released, and has obtained only a cult following since. Despite its truly glamorous style, The Hunger is ultimately an unglamorous depiction of the vampire as a destructive force. Miriam the vampire is surrounded by great beauty, is herself beautiful on the outside, but she truly has no soul. She is hollow. I’ve wrestled with some of the same issues in writing Martha’s Children. However much they differ from Miriam Blaylock, the vampires of Martha’s Children face a similar problem. In becoming vampires, they have sacrificed the sexual lust for the blood lust, and yet they can’t seem to leave sexuality behind. In fact, they can’t even leave humans behind: they live among them while preying on them. Every vampire in Martha’s Children faces the problem of deciding what to live for, and how to live with people. They don’t all solve the problem the same way. As usual, I rephrased and didn’t quite clean up. Fixed. Thank you.